Xiaomi has just released a new mid-range err the redmi note 6 pro introduces a dual selfie cam and the screen not show the redmi note series and it's just arrived so let's check it out. 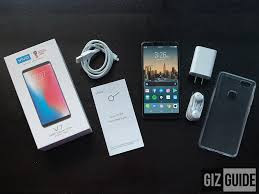 So let's get this box open take this plastic off, here we go and we immediately see the phone at the top, peel off these stickers and here is the Redmi note 6 pro in black, underneath that we have a package containing a clear plastic case for the phone and some reading material, next we have the charging cable actually it's microUSB here not USB-C and there's a 10 watt charger wait shouldn't there be a sink you somewhere oh here we go. So now that we have the Redmi note 6 Pro in our hands let's go over his key features. A tall notched screen- while Redmi note phones in the past have had screens with tall aspect ratios this is the first to bring a notch screen cutout to the table, the screen is a 6.3 inch IPS LCD with a 1080p resolution in a 19 by 9 aspect ratio, the notch at the top is quite wide but you can't hide it with a black bar if you don't want to see it, overall the display looks pretty good so far, we'll test it out and let you guys know how it does in our full review. The redmi note 6 pro has two selfie cameras another first for a Redmi phone the main camera is 20 megapixels in f 2.0 and the secondary one is a 2 megapixel depth sensor, the depth sensor should help to create better results in selfie portrait mode. Here's a couple we took for you to check out, strangely even though there's an advanced selfie setup there's no face unlock option, you'll have to stick to the fingerprint reader on the back. Dual rear cameras with AI support- the Redmi note 6 pro has a dual camera setup on the back as well actually the same is on the Redmi note 5 AI dual camera phone, it's a 12 megapixel F 1.9 main cam with dual pixel face detection autofocus and a 5 megapixel depth sensor. When toggled on the AI can recognize scenes and adjust settings accordingly so far camera quality seems similar to the note 5 as expected with the same setup, here are a couple of shots we took during the day. Unfortunately you can only record video up to 1080p at 30fps there's no 4k option available although it has been missing from the Redmi line for a while now. 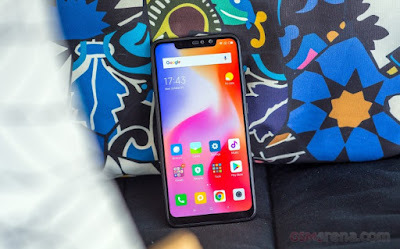 A reliable chipset- this phone runs on a Snapdragon 636 chipset the same is on the other Redmi note phones that came out this year, you can choose from three four or six gigs of ram and performance feels good, the Snapdragon 636 does well for a mid-range chipset nearly topping the charts in this price range ,it's built on a decently efficient 14 nanometer process too, but it's a little more power-hungry than the power sipping Snapdragon 625, but even so the Redmi note 6 pro also shares the same four thousand milliamp hour battery of his predecessors and battery life should be quite good as well. The MIUI launcher the user interface of the Redmi note 6 pro is MIUI 9.6 over android 8.1 Oreo, we're not sure when he'll get updated to the latest MIUI 10 but at least we get a global wrong here with the long list of supported languages and Google services pre-installed, though it isn't close to stock Android the interface feels pretty clean and blowed free, swiping to the left opens up customizable panels which give you quick shortcuts, a space for notes and upcoming calendar events. Swiping down on the homescreen will bring down the notification shade and swiping up will start a Google search and there are proprietary tools and multimedia apps available from Xiaomi, but it will take a more in-depth look in our full review. 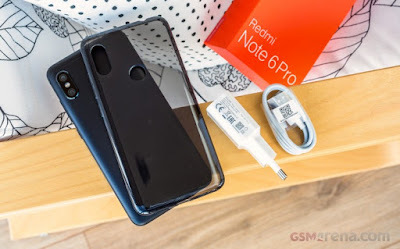 So there you have it guys the Redmi note 6 pro looks like a decent mid-ranger and it comes with a few upgrades over the R edmi note 5 AI dual camera phone plus price wise it should be a pretty good deal too, what do you guys think let us know down in the comments below as well as any questions you might have I'll try to answer them in our full review coming soon. Every phone coming out these days has a dual camera setup, but not many can boast three, this one can its Samsung's Galaxy A7 2018, it's just a ride so let's check it out. 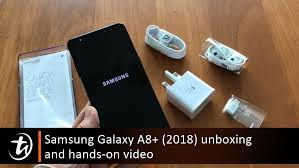 So we have the box here and under the way it is the Galaxy A7 2018, let's take this plastic off and check it out pretty shiny, under that we have some reading material and here is the sim tool, there's a microUSB cable, no USB-C here it's bundled with a 7.5 watt charger and finally there's a pair of earbuds included in the box nice. An eye-catching design- with the coating as shiny as this one the A7 is sure to turn some heads, the uniform metallic blue covers both the glass back and the aluminum frame, the glass is curved a little bit where they meet adding some extra shiny highlights down at the bottom we have a 3.5 millimeter jack for headphones, but what was Samsung thinking with this outdated microUSB port since last year's had USB C and what happened with the water resistance. 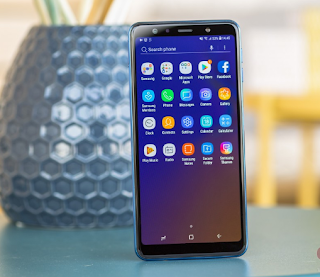 The Galaxy A7 has a 6 inch AMOLED display with a tall 18 point 5 by 9 aspect ratio unlike plenty of other mid-range phones these days the A7 doesn't have a screen notch cut out the selfie cam and sensors are embedded in the top bezel, the display itself has a 1080p resolution and content looks pretty sharp, we'll run some display tests and let you know how it does in our full review. In true Samsung fashion there's an always-on display too great if you want to check notifications at a glance there isn't a notification LED though if you were looking for a more power saving option. The Galaxy a7 2018 has a fingerprint reader mounted on the side most phones have it either on the back panel or on the chin on the front, I can't say I'm a big fan of this it feels kind of slow to read and wake up the phone and maybe it's just me, but it didn't seem to respond a hundred percent of the time. But one neat trick is that you can swipe down on the reader to pull down the notification shade making things easier if you're using the phone with one hand, there is face unlock too if you want to use that it seems accurate though probably not the most secure option. The triple camera setup- let's talk about one of the a sevens most hyped features the triple camera though there are three cameras you can't shoot through all of them there's the main 24 megapixel wide-angle cam, then there's an 8 megapixel ultra wide-angle cam, the third is a 5 megapixel depth sensor, the main cam has phase detection autofocus. We snap a couple of photos during the day for you to check out looks decent so far. There's an intelligent scene optimizer too which can automatically adjust settings for you AI scene recognition is getting quite popular these days, the ultra wide cameras you take those super wide shots just a click of the toggle and you can catch all of your friends or a whole building and there's a 120 degree field of view. There's a bit of distortion at the edges but that's normal overall it's a pretty useful option to have. Here's a look at the portrait mode on the a7 20-18 the D focus background is adjustable and edge detection looks mostly accurate so it looks like the depth sensor is doing something right. A decent mid-range processor- the A7 2018 runs on Samsung's Exynos 785 chipset, an upgrade over last year's Exyno 7880, it runs on 8 cortex A73 cores instead of the A53 cores of last year, along with increased RAM at 4 or 6 gigs it should result in a nice performance boost. From what we've seen so far the UI Samsung experience 9 seems to run quite smoothly too. So there you have it guys the A7 2018 seems to be a solid mid-ranger with some cool camera options, I'm not a big fan of them moving the fingerprint reader though and losing the water assistance and USB-C port of last year what do you guys think, let us know down in the comments below as well as any questions you might have and we'll try to answer them in our full review coming soon. Honor has a new high-end phone its aimed at the gamer crowd, happily named the Honor Play is just arrived, so let's check it out. Take off the cover and you see the phone covered in some kind of sleeve, let's get that off and here's the owner play, ours is in the signature ultraviolet color no it looks more like a lilac, alright put that off to the side and next is a little box with a case inside and we have a little paper holder for the sim key, there doesn't seem to be any headphones here but here's a USB type-c cable and the 18 watt Huawei quick charger. So now that we have the honor playing our hands let's go over as key features. 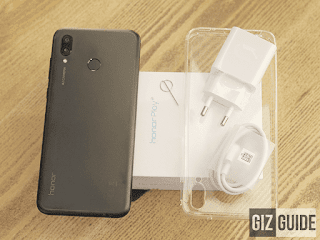 There are quite a few features on the honor play which cater specifically to gamers, the first is of course the processing power, the honor play comes with Huawei top chipset the keren 970 neither four or six gigs of ram, because it's a last year's chipset it's a bit outclassed by the current top performers and benchmarks, but still it is flagship level and even has a dedicated chip for AI driven tasks. 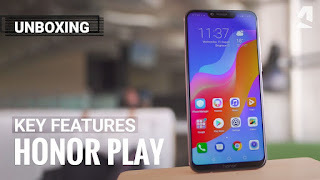 The honor play also comes with hallways GPU turbo software update pre-installed this software helps the GPU run games more efficiently resulting in steadier frame rates, however GPU turbo only works with two supported games right now Pub-G and mobile legends bang bang, we did a whole video on GPU turbo a couple of weeks ago. The honor play will attempt to add an extra dimension to gaming via a new feature called smart shot, the phone will vibrate based on scenarios that detects in a game like explosions or shooting sort of like vibration feedback in a gaming controller, unfortunately there's no rumbling yet honor says it will be added later via software update and even then it'll be for select titles like Pub-G, you should be able to download plenty of games through the honor play there's 64 or 128 gigs of internal storage and it is expandable. Hopefully the large 3700 mah power battery will keep you gaming for quite a while without need for a top-up, with the bundled 18 watt quick charger though charging speed shouldn't be an issue and finally if you plug in headphones you get access to Huawei instant sound options, these include 3d audio which simulates sounds coming from specific directions in game. The games must be supported though I was only able to get it working on a couple so far, unplug the headphones and you just have your standard bottom firing speaker. Unlike recent Honor and Huawei phones, the honor play is made of aluminum not glass. It isn't a compact foam it's quite tall and not too thin either, though it is and glossy and eye-catching it's still pretty easy on the eyes, on top of our ultra violet color there's also a midnight black and a navy blue option there's also a player edition with red accents and laser engraved PCB like design. 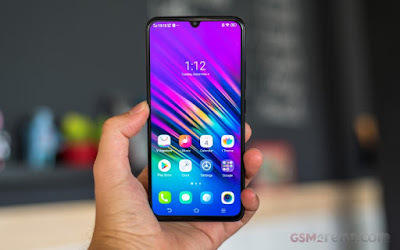 The fingerprint reader is on the back it's nice and responsive to wake up the phone on the front the honor play has a 6.3 inch IPS LCD the 1080p resolution and it's Hall aspect ratio there's a pretty wide notch cut out at the top which thankfully you're able to hide with a black bar. Overall the screen looks good it seems bright enough and content is sharp. The Honor Play comes with the latest EMUY 8.2 and most extended AI integration EMUY has always been a heavy skin but since it's well optimized for the hardware inside it runs without a hitch, there are quite a few proprietary features and a lot of them use the neural processor for example in this latest edition of EMUY the gallery is supposed to be able to sort photos for you based on the scenario in the picture and create highlight videos. The AI is also used to boost face unlock making it more accurate and reliable, of course AI driven scene detection is present on the camera too just like on the latest Huawei phones, don't classify the scene and adjust settings accordingly don't worry even if you turn off the AI mode photos with the 16 megapixel F 2.2 main shooter will still look pretty good and here's a portrait shot made possible by the depth sensing 2 megapixel secondary cam. Finally let's take a look at the selfies taken with a 16 megapixel F 2.0 front-facing camera we'll go more in depth about the camera quality in our full review. So there you have it guys Honor really wants to attract gamers with this phone, I'm excited to see whether these features are actually worth it or just a gimmick, what do you think? let us know in the comments down below as well as any questions you might have we'll try to answer them in our for review coming soon. Who better than blackberry would be able to successfully manufacture and market a smartphone in 2018 with a QWERTY keyboard, this is the BlackBerry key2 and it's the only smartphone on the market to have a fully equipped QWERTY physical keyboard. The Key2 comes as a refinement of its predecessor the Key1, so exactly how much has the Key2 improved over the Key1? Let's find out together. Maybe those from a younger generation haven't seen or heard of a blackberry phone, but when you do see one regardless of how old you are you'll know it right away, the Key2 keeps the blackberry’s classic form factor some kind of display sitting above some kind of keyboard, we'll get back to the keyboard in just a little bit. The key2 has a really nice textured back on the phone which makes us wonder why other manufacturers aren't doing this, it improves grip and prevents the phone from sliding through smooth surface. 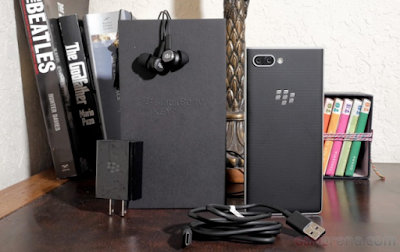 Above the classic blackberry logo is a new dual camera which can do two times zoom and take portrait shots, at the top there's a 3.5 millimeter headphone jack which works great with the included earbuds, there are even extra replacement tips included in the box. All the key twos buttons are now on the right side a volume rocker, textured power key and BlackBerry's convenience key, the keys themselves feel very satisfying and click and feel just like the keyboard. This isn't any kind of keyboard though it was referenced after the BlackBerry Bold 9000 keyboard one of the best the phone maker has ever designed, so the key tooth buttons have really good feedback and it's typing accuracy has greatly improved, the keys themselves are a bit roomier than the key1 and the keys are now matte instead of queasy even the fingerprint scanner is matte, it's also quick and reliable for unlocking the phone. 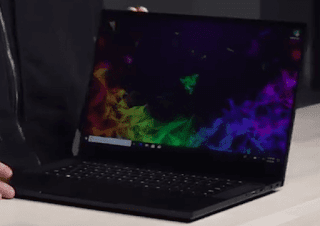 The backlit keyboard looks awesome in the dark and we appreciate the disappearing capacitive navigation keys, we kind of wish this display was taller and the navigation buttons were on screen so it wouldn't need to use the awkward 3x2 aspect ratio. There's definitely a relearning curve when coming from a virtual keyboard in fact it took me a few days to get back into the groove of typing on these keys, the downside to this keyboard is it makes doing things with one hand more difficult this is definitely a two-handed phone of course it's not entirely impossible to type with one hand if you're determined enough. Moving on to the display, there's a 4.5 inch with a funky 3 by 2 aspect ratio and for resolution think of 1080p except the wider dimensions are cropped off, this aspect ratio makes it awkward to watch anything on the screen most videos are either 4x3 or 16x9 so you'll definitely see letterboxing either above or next to the video. What this display is good for is viewing documents, writing long emails and maybe scrolling through twitter, well what it's not good for is viewing Snapchat or Instagram stories the weird aspect ratio crops all the top and bottom ends of the stories you watch and the stories you create are also cropped on taller displays this just makes for a bad experience with all platform stories in general. The LCD does get fairly bright but out in direct sunlight visibility is just average, there's a tab that lives just on the edge of the display and this is a shortcut to the BlackBerry hub you can peek at your calendar, hub emails, tasks and contacts the hub is a fully customizable email client that also shows you most apps notifications, you can filter notifications by app and there are even options to snooze notifications so you can get back to them later which is pretty cool. D-Tech is another great BlackBerry tool, it's a fully comprehensive security suite and what makes this different from the regular permission settings that come on Android is that you can receive alerts when an app has requested a sensitive permission, we haven't realized how often are actually pinging our location until we see it on D-Tech, two other blackberry specific features are privacy shade and redactor, privacy shade makes it harder for people with wandering eyes to peek at your messages while the redactor lets you block out sensitive information before sending a screenshot or showing something to somebody. If you love shortcuts then you'll love this phone each of these letters on the keyboard can be programmed to a short or a long press shortcut for a total of 52 programmable shortcuts ranging from calling your boss to toggling Bluetooth, there's also a new button on the keyboard called the speed key this lets you access your keyboard shortcuts without having to go back to the home screen first think of it as a shortcut for your shortcuts and if you thought 52 shortcuts was not enough there's a contextual and programmable shortcut key called the convenience key, it's the one right below the power button and you can program this to perform any shortcut, what's awesome is you can set different shortcuts whether you're home, in your car or in a meeting, by this point we have to say we're impressed by the extensive customization that BlackBerry has thought to put into its phones. Performance is much improved over the Key1, the Key2 runs so much quicker and smoother thanks to the snapdragon 660, not only this but BlackBerry has also doubled the amount of RAM to 6 gigabytes for better multitasking, casual games run perfectly fine on the key2, its landscape games that are really awkward to play on this phone and if you hold the phone with the keyboard to the left it's really easy to block the loudspeaker with your palm, so games on the Key2 not a really good idea. This choice of processor won't win any benchmarks but its power efficiency along with the smaller display definitely helped the phones 3500 milliamp hour battery reach a great endurance score at 86 hours, the phone is quick charge 3 compatible and the included charger brought the phone up to 47% in half an hour of charging, if you want to charge it even quicker though you can choose to use boost mode so the phone's power draw is reduced while charging to really minimize charging time. Finally we've reached the camera, this camera system is made up of dual 12 megapixel sensors this setup uses a combination of a wide lens and a telephoto lens for shooting up 2 time zoom and bouquet portrait shots. You would think that this dual camera could shoot better than the Key1 single sensor camera, but that's not the case, the cameras photos are only averaged, in fact the dynamic range was not good details are not very good either and some of the pictures have noticeable noise, colors are just a tad oversaturated and contrast is too high, this is not a good recipe for balanced exposure. The Key2 HDR mode uses image stacking to expose better and to reduce noise, but setting HDR to automatic resulted in softer looking images set HDR all the way on and the pictures are softened even more, HDR is meant to help dynamic range, but we found that the Key2 HDR mode was more of a hit or miss situation, we even found the white balance to be inconsistent between shots on occasion. If you take the phone inside you won't find any better looking images, details are progressively worse and HDR won't make it any better in indoor lighting, HDR will soften the image. So if you're trying to take a low-light shot we recommend you take it with HDR off and then use an editing tool to adjust exposure. Portrait shots were surprisingly good just a tad bit oversaturated for our tastes otherwise the bouquet was pretty much spot-on, selfies are on a whole different level this is an 8 megapixel camera and it takes below average selfies. The white balance is even more consistent here than on the main camera and contrast is still high, colors are oversaturated still and the selfie camera eclipsed highlights very easily so it struggles with dynamic range in general. Moving on to video it's not very good either foliage was quite dark in 1080P, so resulting details were no good, again this is due to poor dynamic range switch to 4k and there's noticeable improvement in details. We really think the Key2 could have benefited from optical image stabilization, there's an enhanced video stabilization mode but it's only offered in 1080p video, we would not recommend shooting 4k video handheld unless you're using something like the DJI Osmo or you have it set down on the tripod. 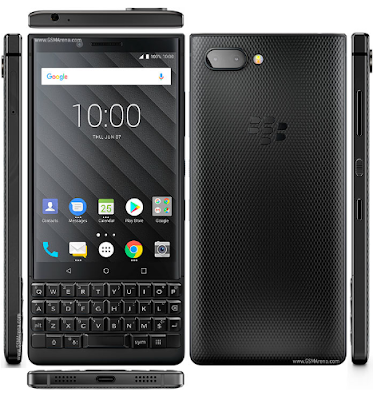 The Key2 is such an excellent Blackberry, it's keyboard is A+ the UI is vastly customizable and versatile and the battery lasts well a day or two, this makes it the perfect phone for road warriors like real estate agents or field workers who need to be in constant communication. We feel that the phone could have improved in two categories, the display could afford to be a little bit sharper and brighter while the camera on this phone should have just been the same one from the Key1, it was a bit slow but it took very respectable photos, so we understand the Key2 is not a phone for professional photographers, we expected the Key2 camera to be the same or better than the Key1 and we're sad to say that blackberry really dropped the ball here. Still it was so refreshing to see a phone that wasn't trying to emulate any other smartphones notches or antenna lines, the Key2 is uniquely and unapologetically a blackberry and nothing else. You'll definitely find better value in another phone like the Oneplus 6 or even the honor U10 both starting at less than $600 and have way better dual camera setups, but again those who do end up buying this phone are so on the keyboard. Blackberry is still climbing its way back up as it regains relevance in the smartphone market, so for now the brand and the product remain in a niche category, many people have moved on from physical keyboards years ago, but for those who'd rather not and frankly don't like to take many pictures, the BlackBerry Key2 is an excellent choice. When it comes to smartphone cameras Huawei’s new flagship the P20 Pro promises some major innovation, it's got three cameras on the back including a 40 megapixel shooter, but do these bring some real advantages or is it just a gimmick? This is my Huawei P20 Pro full review. Huawei has brought an all-new design for this year's P20 pro, unlike last year's all-metal build now we have a build of all glass with a metal frame, this makes for a phone that is pretty eye-catching especially in the Twilight color, it's a gorgeous gradient from purple to green, the corners and edges are rounded and the glass back is curved. It isn't tapered though it feels thick and sturdy. 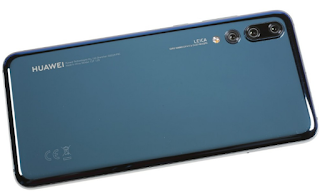 On the back you can see the P20 pro's unique feature, the like a branded triple camera setup. Huawei is warn-up every smartphone manufacturer around. One side effect of these cameras is a camera bump, so the P20 pro will wobble on a table unlike last year's P10, but an improvement over last year is that instead of just being a splash proof now there is full IP 67 dust and water resistance. The P20 pro has a stereo speaker setup one speaker is bottom firing and the other doubles as the earpiece, the sound is clear and decently loud. The speaker's can even reproduce Dolby Atmos multi-channel sound, which is great with the right content. Unfortunately Huawei decided to go without a 3.5 millimeter jack this time around so you'll have to plug in headphones to the USBC port or go wireless. The Always-on fingerprint reader is front mounted just below the screen, it's really fast and responsive to your touch. If you don't want to use a fingerprint reader there's also a face unlock it's really fast just lift or wake up the phone and it's ready, since it uses the front camera it will bring up the screen to illuminate your face if necessary. There's plenty of internal storage at 128 gigs, but there's no microSD slot and at the top is an IR blaster which can be used to control supported appliances around the house. The screen is a 6.1 inch AMOLED with a tall 18 by 9 aspect ratio similar to the Matte 10 pros, the 1080p resolution is lower than the P10 plus is quad HD, but still looks sharp. You may have noticed that there's a screen cut out near the top this notch holds the selfie cam and the loudspeaker the trend started by Apple is making its way everywhere, it's not too intrusive though the screen space next to it is only used to hold notifications and status icons. You can also turn this space black to help hide the notch if it bothers you, regardless content stays underneath and won't be interrupted unlike on the iPhone and with the deep blacks of an AMOLED it all looks nice too. There's very little color shifting unlike on other AMOLED screens, you won't have problems outdoors either the screen is bright up to 580 nits in auto mode and sunlight legibility is great. The UI of the P20 pro is Huawei EMUY 8.1 over Android 8.1 Oreo, apps can be stored either on the home screen or in an app drawer and you can also swipe down from the home screen to open an app search bar. There are different options to choose from for navigation instead of having buttons on the screen you can also have an on-screen navigation bar or navigate using the fingerprint reader with swipes just like last year. There's a theme store with a variety of designs and themes to choose from and Huawei is committed to providing timely Android security updates too. 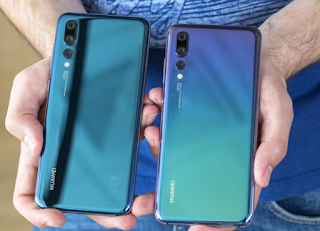 The P20 Pro runs on a kirin 970 chipset with 6 gigs of RAM this chipset is also inside of the Huawei Matte 10 released last fall so it's not top-of-the-line anymore, though the most recent flagships with the snapdragon 845 perform around 30% better in benchmarks, the P20 pro performs well it's quite powerful and should be able to handle any task you throw at it, though it does start to run hot during more challenging ones. The P20 pro packs a 4000 milliamp hour battery, battery life is great but shorter than they Matte 10 Pros, it earned an endurance rating of 89 hours in our proprietary tests. Charging is decently fast thanks to Huawei supercharge we got from zero to 46% in half an hour, sadly there is no wireless charging here even though the back is made of glass. Now let's get to the biggest feature of the P20 pro the only triple camera setup available today, there's a 20 megapixel black-and-white sensor, the 40 megapixel color sensor and at the top an 8 megapixel telephoto lens. 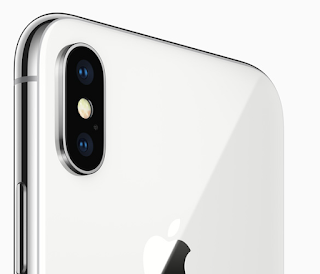 The cameras have OIS and used for different autofocus technologies, the P20 pro also uses AI to boost camera performance, the camera can detect various scenes and tune the settings accordingly you can really see the difference in colors though most of the modes are quite exaggerated, so they might not be to everyone's taste. The default resolution for the color camera and actually all of the cameras is 10 megapixels, photos undergo optimization by combining information from all these two of the cameras at any time, the benefits of reducing the 40 megapixel resolution down to 10 are better sharpness and lower noise. In good light 10 megapixel shots look great with good detail pleasing colors and plenty of dynamic range, they do seem a bit over sharpened upon close inspection but this could change with future software updates as I did with the Matte 10 pro. You can also opt for large 40 megapixel photos but you don't have the option for any sort of zoom and you don't get much more detail. The telephoto camera allows for 3 times optical zoom and five times hybrid zoom, the three times zoom has almost no loss in quality compared to the main cam, the five times looks good but it's not exactly lossless and some noise is visible but still this level of magnification is impressive, no other phone can provide such quality at a high level of zoom. The 20 mega pixel monochrome snapper does well in daylight with sharp detail and wide dynamic range, but monochrome mode isn't the highlight feature, this camera is mostly used in conjunction with the other cameras to improve resolution. In low-light photos produced for the main camera generally look good well exposed though with some visible noise and loss of detail, but if you're trying to make an even nicer picture after dark it's recommended to use the dedicated night mode, this allows for long exposure shots that you can take handheld without a tripod, thanks to advanced AI driven stabilization. The phone is actually making a composite of many photos and it takes a few seconds to process but the results are incredible while some of the shots do still come out blurry the keepers are quite stunning they look almost like they were taken on a cloudy day, showing colors and details that the naked eye can't even see in the dark. The P20 Pro can also use these cameras to create a blurred background behind the subject in portrait mode, you are able to zoom for this type of shot and you can select various lighting effects like on the iPhone. One downside is that you can't change the level of blur in portrait mode, though strangely you can if you take portraits in aperture mode plus you can change their blur levels after they have been taken. For selfies the P20 Pro has a 24 megapixel front-facing shooter they look good but focus is fixed so you have to be careful about how far away you hold the camera. You can take portrait selfies too which aren't too bad. The P20 Pro can shoot super slow-mo video at 960 FPS for the 720p resolution, it's decent but in many ways Huawei version doesn't match up to his competitors by Sony and Samsung. If the captured motion is continuous it works out okay, though processing time after every recording can be annoying, if you're trying to catch a specific moment though it's impossible to control what will be slowed down clips are a short fixed length with a slowdown starting at some point in time after you hit the button. The P20 Pro takes good videos in 4k though, they're nice and sharp and colors look natural without over processing, you can zoom with the telephoto lens too, unfortunately 4k videos don't have stabilization, but in 1080p stabilization is really good though videos do come out a bit softer and less detail than non stabilized ones. To wrap things up, the P20 pro is an excellent phone it goes above and beyond last year's P10 borrowing premium features from the Matte series, like a large AMOLED screen, full water resistance and stereo speakers, but photos are where it really shoots, the 40 megapixel label is a bit misleading but at 10 megapixels the P20 pro does well in good light and it's unmatched in zoom and low-light capabilities. Of course it's not perfect, it's running last year's chipset, the headphone jack is gone and it's a bit pricey too at around 850 Euros, but if you're after a well-balanced flagship phone that can take some awesome photos the P20 pro is worth looking into. OnePlus 5T Unboxing + 5 Things Before Buying! 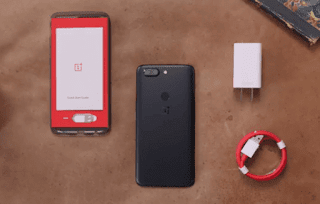 This is the OnePlus 5T, alongside the OnePlus 5T, you get a Dash Charge USB-C cable, the power brick, quick-start guide, sync tool, and if you flip that quick-start guide, you get a not-that-great of a case, but it's still cool that they included it. So today, I want to break this down into five things to know before you potentially go out there and buy a OnePlus 5T, unless you're a OnePlus 5 owner, then you're probably a little upset. I'm sorry. With that said, though, the first thing I want to talk about is pricing. 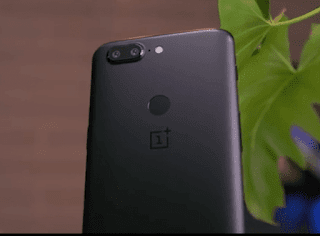 Now, there were rumors that the OnePlus 5T could cost upwards of nearly 700 dollars. And if that upsets you, take a deep breath. You'll be happy to hear the OnePlus 5T starts at a 499. 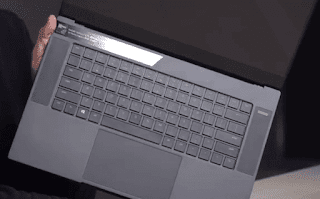 That'll get you 64 gigs of storage with six gigabytes of ram, or alternatively, you can double your storage and bump that RAM up all the way to eight gigabytes for 559. Now, I've seen argumentatively, you can pick up an unlocked Galaxy S8 in the 500-dollar-range on Amazon, but to clarify, those are refurbished models. The cheapest new Galaxy S8 I've seen is about 630 bucks right now. I'm curious to hear, what sounds more enticing? A refurbished Galaxy S8 or a OnePlus 5T? Next up is probably the biggest change of the OnePlus 5T, and that is the display. OnePlus has finally joined that 18 by 9, super-tall screen party. So it essentially is a six-inch display, 2,160 by 1,080, which may be a turnoff for some of you enthusiasts out there. Again, given the price point, I think the screen looks fantastic and if you need more resolution, you can hop up to a Galaxy S8 or even the fan-favorite, the LG V30. 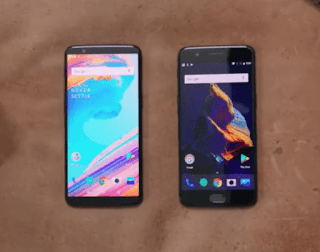 What's nice about this though is if you stack it up side-by-side against the OnePlus 5, the form factor really hasn't changed, you are just getting a taller display. Because of the display, though, you do lose the fingerprint reader on the bottom, but effectively is moved towards the back in a much better location than the Galaxy S8 or Note 8. 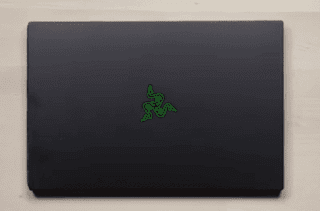 Its right smack in the middle and it works really well. Now, at the event, OnePlus was not shy to take shots at Google and their Pixel 2 display issues, and for those curious about the OnePlus 5T, I have not seen any blue shift on this phone, it looks fantastic. And again, the only potential drawback for some of you out there is it's a 1080p display. Now from there, the third thing to talk about is the camera, or dual cameras, rather. It still features a 16 and 20 megapixel sensor, just like the OnePlus 5 did, but what's kinda weird, is that secondary lens is no longer a telephoto lens. It's the same exact focal length, the same exact aperture, and from what I understand, OnePlus is claiming that the secondary lens is going to be a low-light lens, so when it knows you're in a lower-light situation, it's going to opt to use that one instead. So with that, comes a couple different things. One, portrait mode will still, in fact, work. The only difference is because those are the same focal length, the image will no longer be cropped. Then, number two, when you punch in on the OnePlus 5T camera, that zoom is purely digital. Same thing here is a shot, straight out of the OnePlus 5T camera, and as we zoom in, I got to say, I don't notice too much in terms of a quality loss, but it's still kind of weird to me that they opted for no telephoto lens. Now, this here was one of my favorite shots. On a couple notes, one, this was using that fake, digital, telephoto zoom-in. And two, this was not using portrait mode, it was just straight out of the camera. Now from there, as far as low-light goes, I actually got a pretty amazing test, thanks to Mr. Linus Tech Tips, and the event was super dark, so here is an example of the flash from the OnePlus 5T. Looks very nice. From there, brace yourselves, this was straight low-light, no flash or anything, you're welcome. From there, here's a quick selfie shot from the OnePlus 5T. Nothing special or magical, but still really solid. I got to say, overall first impressions with the OnePlus 5T camera are really good. Now, from there, the fourth thing to talk about is there is now Face Unlock, love the name, now on the OnePlus 5T. From what I can tell, OnePlus is not banking on this being the primary form of security on this phone, especially because you can only use it to unlock things. As far as purchases go, you must use your fingerprint to do those. With that said, though, setup was insanely fast and I think the unlock process may be even faster. No joke, you literally pick up the phone, hold it up to your face, and you are in the phone. So is Face Unlock a game changer on the OnePlus 5T? Nope, but it is a super fast and convenient way to get into the phone and for those who still want that trusty fingerprint reader, you get the best of both worlds. Now, the last thing I wanna talk about is the OnePlus 5T isn't that much different than the OnePlus 5. The weird part is, the OnePlus 5 was not released that long ago, so I'm sure some of you out there who just bought that phone, got to be feelin' a little left out in the dark. They did this last year with the OnePlus 3 and 3T, so it's kind of setting a track record to not buy the first iteration of the phone. The other kind of weird part, too, is it's so late in the year. We're getting closer to the Galaxy S9, or Samsung's prolly going to call it the Galaxy S10. Either way, though, it's really late in the year. And from there, I'm curious to know what you guys think of this. Now, at the event, OnePlus kind of defended this by comparing it to a software update, in the sense that if you have the ability to upgrade hardware, why wait a year? For me, it just kind of feels like this is what the OnePlus 5 should've been. Based off of reactions on Twitter or at the event, I think most people would tend to agree. Granted, there are some pretty solid updates to OxygenOS, which is super clean and customizable. One feature in particular that I think is really cool, are parallel apps. So for example, maybe you have two Twitter accounts, two Instagram accounts, two Facebook accounts, you can actually have a parallel versions of these, where you're logged in at the same time and choose which one you want to launch. From there, maybe the OnePlus 5 really didn't do it for you and you held off buying that, and now, the OnePlus 5T makes way more sense. This is iphone 10 and it's my favorite iphone ever by far and there's no doubt that in the history of iphones this thing is iconic, it's more modern, it finally feels like a new iphone that's a big part of why I like it so much, but that's also the source for a few sore spots, there's a learning curve to this phone unlike any other iPhone. Every other iPhone ever has just been home button, rectangle screen, rounded corners, pretty much the same thing, you know what you're getting yourself into, you know exactly how to use it and if there's going to be one big new feature every year it takes you two seconds to learn it and you're good, iPhone 10 is different with this phone there's maybe three or four big fundamental changes to the way you use the phone. It's very clearly still an iPhone you still mostly know how to use it, but there's a couple things that are different that you'll have to get used to, so on the outside is the shape we're used to the rectangle with rounded corners, but this is the first time the display itself actually has curved corners and it's pushed right up to the edges of the phone and it pushes everything to the corners and keeps all the front-facing sensors in the notch, the forsaken notch at the top it's actually not that big of a deal. Just holding the iPhone 10 though it feels great, I think it's an awesome size, but if there were a bigger iPhone 10 plus I would totally get that, right now despite the larger display the 10 is definitely closer to feeling like an iPhone 8 than 8 plus, it still feels like a smaller phone compared to the others I've used and also thanks to the stainless steel sides it's definitely slippery and it's definitely going to slide out of your pocket at least once it happens to the best of them and it's crazy the silver it's so shiny and honestly we all know your phone is never going to look as good as it does fresh out the box unlike the more matte finish of the previous iPhone, I'm not convinced this super shiny finish on the iPhone rails is going to last like this we've seen this before in other products it definitely gets chipped and scratched, but D-brands got something new for the 10 “The Grip” so like the name implies this thing is supposed to be the best way to grip your phone. It is now officially the most breakable iPhone ever thanks to having glass on the back. The one part of the hardware of this phone I actually really don't like is the camera bump, but not just for the usual reason like rocking on a table I've just kind of accepted that at this point but because of the new orientation a couple times I've noticed it's easy to accidentally get your finger in the photo or video you're taking just because it's all up in the corner it might take a couple days to get used to that and stop getting your finger and the corner of your shots. What's really become the signature feature of the iPhone 10 is on the front and it is the notch up at the top of the display. 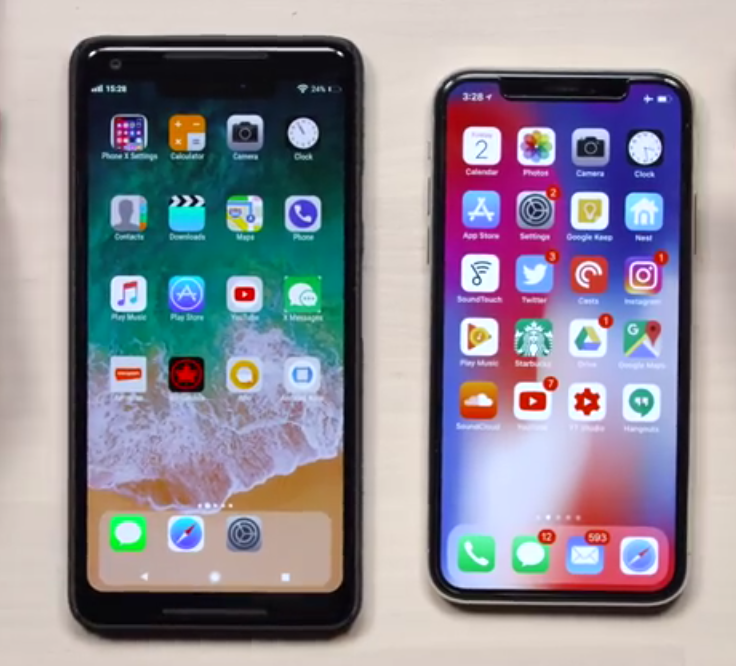 Apple have come up with the opposite solution which is “embrace the notch” so in all their software and all the software they'll promote is apps that wrap right around that notch and fill up the whole display, that's what an optimized iPhone 10 app looks like and since this is a taller aspect ratio apps will have to get updated to do this, developers will have to get on their horse and actually put in the work and update their apps to get them to fill up the display. 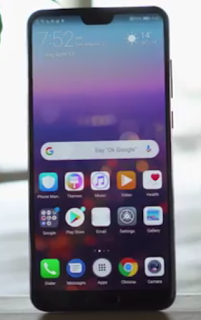 The only time I really think about the notch is when I'm watching videos, yes it gets kind of awkward here because when you're watching videos fullscreen the notch will cut off some of the display some of what you're trying to watch, so if you want to avoid that you can actually double tap and it'll bring in the video you're watching on this OLED display now you have some more bezels, but at this point now the video you're watching is so small you might as well not be watching it on a bigger screen it feels like the same size as the iPhone 8, so this whole thing is the main reason why I would actually want a plus size iPhone 10, as for the rest of the display it's great, Apple calls it a super Retina display, I just call it their first OLED in a smart phone ever finally and it's it's pretty awesome it's a 5.8 inch panel, high pixel density, it supports the p3 color gamut, HDR, it has true tone, it doesn't get as bright and saturated as Samsung's like note 8 and s8 displays, but it is still bright enough not too cartoonish with the colors, has a small blue shift when you tilt it off axis but so do many other OLEDs to varying degrees and it still has 3d touch although I pretty much stopped using that completely except for lock screen controls that I wish I could change, so the screen is awesome and it's a big part of why this phone looks so good from so many angles. Of course, when you go to a full screen display like this you lose the home button, so that's why iPhone 10 replaces that home button with whole bunch of gestures this is the biggest learning curve of any iPhone ever, but it's still not that bad. 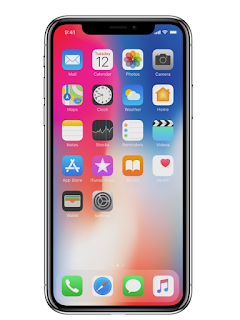 You swipe up from that bar at the bottom of the screen at any time to go home now anytime you see that bar it represents the home and whatever app you're in will close itself just like any other iPhone hitting a home button. Swipe down from the top for notifications, but now swipe from the right corner for your control center and for multitasking again you have no home button so you swipe halfway up and then over to get through your recent apps, that'll get you to that same card style carousel as before, but overall once you get hang of this system once you get used to all this swiping which took me a couple days it felt pretty natural. I actually started trying to swipe up on other phones which shows you how weird how much I got used to that the one that took me the longest was multitasking because I started off thinking you had to swipe up then wait and then the cards show up, but that always felt so slow but what you really have to do to get this to work is you swipe up and over and I gets you to the cards way faster so that's a pro tip for anyone who is still swiping up halfway and waiting for the cards to show up like I was, you're welcome. For those with small hands or who just really liked reach ability on the bigger iPhone you technically still have it, here it's buried in the accessibility settings but you can do the little swipe down on the bottom of the screen to bring the top corners within reach and that makes getting a top gesture is easier with one hand, I leave that on it's pretty useful sometimes. Now of course, the other big change that comes with ditching the home button on iPhone 10 is he also just ditched that fingerprint reader which means as you may have heard they needed to replace that with face ID (facial recognition). 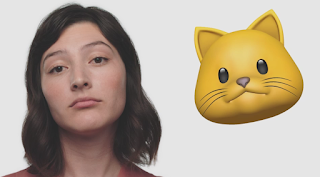 Face ID on the iPhone works really well most of the time, it's not perfect and I think touch ID was closer to perfect as far as fail rate goes but it's still impressively good and I still believe that touch ID is definitely still faster, but face ID can get better with software updates and with time as millions of people begin to use it I think that'll happen and it still also has some physical limitations that you can become aware of and avoid just like touch ID had some physical limitations that you could become aware of like when your fingers wet or it doesn't quite work because of stuff on your hands or if you have a glove on stuff like that you just know touch IDs not going to work so you put in the passcode. Face ID has some physical limitations too, it works by bouncing thousands of little infrared dots off your face and back into the sensor and creating a map of your eyes nose and mouth it doesn't actually use the front-facing camera and it can learn a changing face over time it still recognizes you when you get a haircut or shave a beard or put makeup on, none of this stuff has a huge effect on the dot map that made of your face it also won't be tricked by a picture of you because that doesn't have the depth of your face and I can also work through some pairs of sunglasses again the ones where the infrared light can get through, but face ID has been known to fail when you're backlit or when there's like a ton of extra infrared light coming in basically from the Sun it's like how a dim flashlight doesn't work when it's really bright out same thing face ID is going to get blinded by all that extra infrared light just got to type in your passcode, but those times for me were few and far between, if touch IDs success rate was 99% to me it felt like face IDs success rate was like 95%. I can add up when you unlock your phone hundreds of times a day, but again this can get better as it gets used more there's even some settings as well where you can turn attention on so it won't unlock if you're just holding the phone up to your face not only that but you have to be looking at your phone then it'll unlock and show all your notification data works pretty well for me just please don't do this while driving and even if face ID is this workaround to not getting the fingerprint reader underneath the glass in time for this phone, I still think that at its best facial recognition on a phone is closer to secure seamless authentication than a separate fingerprint reader ever would be because with this you just pick up the phone and it works you use it you login you pay for stuff you download apps etc, but if someone else picks up your phone it won't work it's that simple. Then there is an emoji possibly maybe the most fun feature of iPhone 10, but you know it's hilarious these moving facial tracking and emoji are iPhone 10 exclusive, you can't get this on any other iPhone, so if you get one of these then you know the person that sent it has an iPhone 10 and weirdly enough if you send this to someone with an Android phone they just get a video message of this an emoji, but here's the thing an emoji is just using the front-facing camera, an emoji is working and continues to work even when you cover the depth sensors and the extra front-facing sensors all that stuff, it'll work when you cover everything except for it the front-facing camera which means they totally could have made these available for any other iPhone, but they didn't. iPhone 10 also has some slightly new cameras same exact sensors for both cameras as the iPhone 8 plus but slightly better glass and now both are optically stabilized so this is going to get you some meaningfully better performance with the 2x telephoto lens and zoomed in photos and zoomed in videos things like that which is good to see because I avoided using it with previous iPhones and as you'd expect photos from the iPhone 10 look awesome, I'm especially happy with how much dynamic range we're getting HDR on previous iPhone cameras used to be a lot less aggressive and I kept asking over and over for a little more a little more and now photos really pop the sky is like always so blue, details is there, color accuracy is tight, it's not as good as the pixel 2 camera just going to say that right up front, but this is a top 5 smartphone camera and no doubt and despite his tendency to overexpose I think it might be the best front-facing camera for video for any smartphone, they've also added portrait mode to the front-facing camera for portrait selfies on the 10, but it doesn't work nearly as well edges get blurred super hard almost to a comical amount when compare it to something like the pixel 2 or even the back facing camera, but the thing is pixel 2 does all this so much better because of machine learning and software, so in theory iPhone 10 can keep learning and get this good too, plus it already has better color accuracy so I'll be on the lookout for that software update. Now you may have noticed we've made it all this way into an iPhone review without talking about any of the specs shows how important that is, but iPhone 10 is rocking the a11 Bionic chip and three gigs of ram and it's awesome in fact it's really good, I would say this is the most powerful mobile chipset in any smartphone right now the benchmarks are insane, but this isn't for iOS this is for all the things that run on top of iOS, the augmented reality apps, the image processing, the super slow-motion video all of that stuff, it obviously feels more modern because of all the swiping and the gestures now, but as far as functionality, it has all the same stuff and features you're used to, has all the same quirks you are used to, like iOS this notification system is still a mess since they don't group apps together this is still easily fixable but there's plenty of other things I wish would be different about iOS too, but it's Apple they're stubborn you'll get used to it. Battery life on the iPhone 10 has turned out to be pretty great close to the iPhone 8 plus I would say again iPhone is a champ of standby time and it always has been so no problems there and it handles the biggest iPhone display ever pretty well thanks to it being an OLED, I haven't had any problems getting to the end of a single day with full use if you want to use that screen on time metric it's usually around 6 hours. So the bottom line and the question that I get the most often about this phone is so what do you think? This is my favorite iPhone ever by far I really like it. Is it worth $1000? Honestly I don't think people spending the money on this phone will be disappointed. But those are all things that I think people who are buying this phone are already used to or were expecting and for that reason it's not a deal-breaker in 2017 so I'm happy to be carrying this phone, so if you were thinking about going out and getting this phone go ahead I think you'll like it too. I got an email recently with a bizarre suggestion and a link to apps that let you turn your android phone into iPhone 10. Why would someone want to that? 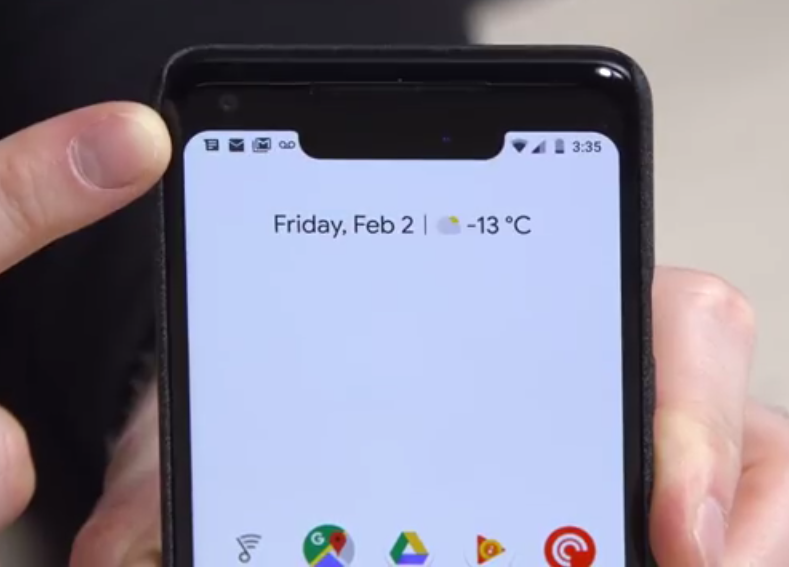 Obviously your android phone will not magically turn into iPhone 10, but what this guy did is an iPhone 10 launcher for Android. One of the great things about Android device is that you can do some pretty weird stuff out of the box, you can install any launcher that you want and there’s plenty of good ones and weird ones. Maybe there’s a little bit of practicality for individuals coming from iOS super familiar with the iPhone 10 gestures and want to switch over, truthfully I think this idea is more of novelty. Nonetheless, I have been asked to check it out, so I went ahead and do so. There are bunch of this apps on the Google playstore, I never imagine this eco system even existed anyhow, I selected the first one in the search result, Phone X launcher this particularly one already has over a million download. Phone X launcher turns android into iPhone X, ios 11 & control center IOS 11 with iLauncher. 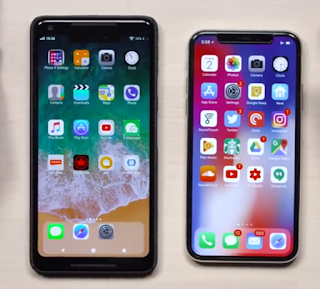 In the past I showed you guys an app that put the iPhone 10 notch on any android phone, Phone X launcher obviously goes a step further, but some of the implementation here is similar. To start the Phone X launcher you pick an iOS inspired wallpaper, enable permission for notification access. Firstly I tried swiping up my pixel 2 XL really felt like iPhone 10, at the top I have a different look and feel to the quoa to the reception meter after clicking it I got a notch on the launcher which really looks bizarre. I think if you have the pixel 2 XL this is probably the last thing in the world you thinking about doing, maybe if you have some older android phone and you are sick of it for some reason and this may change it a little bit for you, gives you icon that looks like iPhone, anyway it puts you in the same territory so you can catch your width of the Apple universe and it’s funny you see chrome with safari logo, actually I can’t recommend it. If you want to completely change the look and feel of your android phone, download something like Nova it’s also free and has about 50 million download and it’s real legit, you can change everything about the look and feel of your android phone. With Nova you can change the size of logo, you can swipe out individual logo do lot of stuffs, I personally recommend this other than changing your android device into iPhone 10 interface.